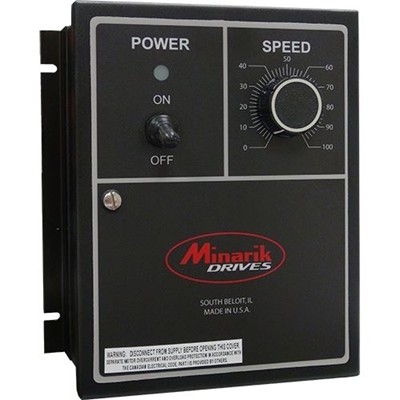 Minarik Drives' standard MM23401C drive is housed in a NEMA 4X enclosure guaranteeing protection from washdown applications, corrosive material, wind-blown dust, incidental contact with enclosed equipment or unwanted external solid objects. The MM23401C provides sound performance for DC brush-type motors from 1/8 to 2 HP. This stand-alone cased drive contains a neon power light, pre-mounted heat sink, power switch, and speed adjustment knob accessible from the front of the enclosure. 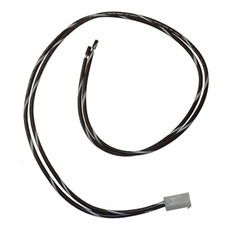 Using full-wave rectification of the AC line input, this SCR drive provides a 60:1 speed range. 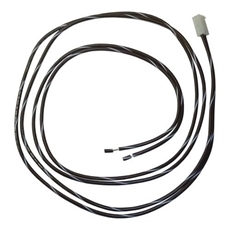 Users make all wire terminations at the screw terminal block inside the enclosure. The dual voltage capability allows these drives to operate from 115 or 230 VAC, 50/60 Hz, to run 90 or 180 VDC motors.